SCVHistory.com BW8601 | Newhall | Chamber of Commerce Meeting in Pardee House, ~1985-1987. Photo by cityhood proponent Bob Weber. Visible here are several city proponents including (Chamber manager) Jo Anne Darcy, Connie Worden, Viki Rudolph and Ruth Newhall. 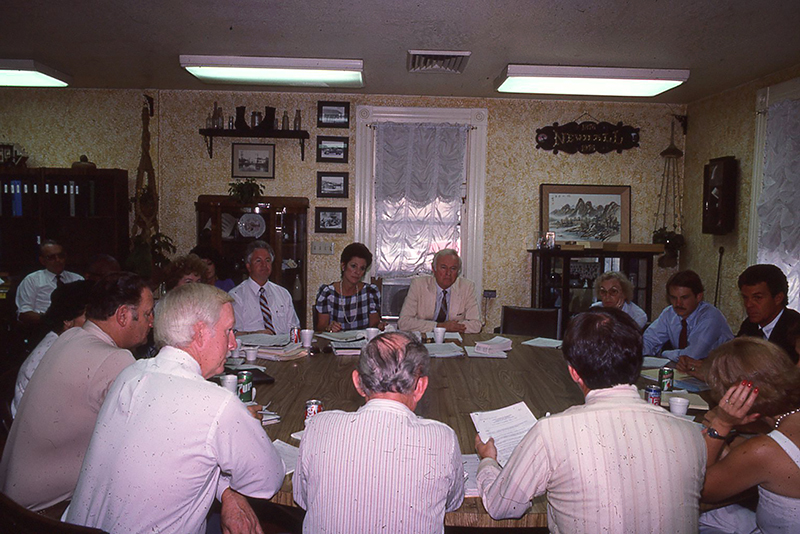 The Chamber of Commerce, especially its Transportation Committee, was the de-facto local government for the Santa Clarita Valley prior to cityhood in 1987. The chamber facilitated the exchange of information and conveyed the community's needs to county, state and federal agency representatives at its meetings. BW8601: 9600 dpi jpeg, Bob Weber Collection. Online only.